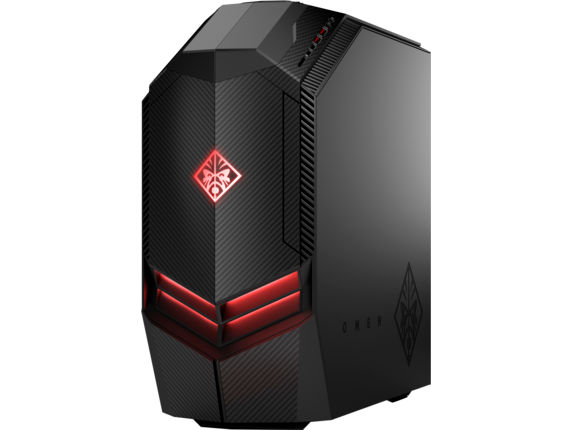 The OMEN Desktop is geared with a cutting-edge design, the industry's latest hardware, and easy upgradability to crush the latest AAA titles, and give you the top-tier performance competition demands. With optional dual NVIDIA® GeForce® GTX™ 1080 Ti or dual AMD Radeon RX 580 Graphics, crisp gameplay becomes a dangerous weapon in your arsenal. Powered by the new NVIDIA Pascal™ architecture, the NVIDIA® GeForce® GTX™ 1080 Ti delivers improved performance of previous-generation graphics cards, plus superb energy-efficiency, innovative new gaming technologies, and breakthrough VR experiences. The NVIDIA® GeForce® GTX™ 1080 Ti comes with ultra-fast FinFET and high-bandwidth GDDR5X (G5X) technologies, as well as support for DirectX 12 features to deliver fast, smooth, and power-efficient gaming experiences. NVIDIA® GeForce® GTX™ 1080 Ti is built to meet the demands of next-generation displays, including VR, ultra-high-resolution, and multiple monitors. It features NVIDIA GameWorks™ technologies for extremely smooth gameplay and cinematic experiences, plus revolutionary new 360-degree image captureâ€”even in VR. Discover next-generation VR performance, the lowest latency, and plug-and-play compatibility with leading headsetsâ€”driven by NVIDIA VRWorks™ technologies. VR audio, physics, and haptics let you hear and feel every moment. The new NVIDIA® GeForce® GTX™ is meticulously crafted to offer superb heat dissipation using an advanced vapor chamber and premium materials, so it runs as cool as it looks. Built on the future-ready Polaris architecture, Radeon RX 580 Graphics play your favorites at a smooth frame rates and high resolutions. Effortlessly capture, stream, and share your memorable moments and clutch victories with Radeon ReLive. Fine-tune a range of settings to fit your needs with Radeon WattMan. With powerful DirectX® performance and Asynchronous Shaders, you'll feel confident that your investment will last for years to come. Jump into imaginative virtual realms using Radeon RX 580 Graphics. Let AMD LiquidVR™ technology transport you to remarkable virtual worlds. Feel the rush of groundbreaking gameplay, the deep connection with other virtual players, and the thrill of living out your favourite movies and experiences with the next wave of immersive VR and cutting edge Radeon graphics. Radeon RX 580 Graphics are ready for the latest display technologies like DisplayPort™ 1.2 and HDMI 1.4, delivering a higher level of graphical fidelity in your favorite games and multimedia experiences. Radeon Freesync™ technology8 helps reduce input lag and screen-tearing. The Polaris architecture with features like Radeon Chill technology take power saving to the next level by automatically and intelligently optimizing framerates based on your in-game activity. The latest generation FinFET process enables high frequencies at low power, helping cool your card. The game's outcome is in your hands. Choose from the latest in processor technology, including Intel® Core™ processors1 (K series on select models)2 or AMD Ryzen™ processors, unlocked for overclocking. Radiate confidence with a bold, machine-like design. Ready for battle inside and out, the OMEN Desktop is a force to be reckoned with. Easily amplify your desktop's performance. Tool-less access makes you the champion of upgrading your hardware, while an optional see-through door and red internal lighting show off your gear. Need to move your battle station? The integrated carrying handle has you covered with convenient transportation to your new spot. Easily plug in your favorite gaming accessories with front, angled ports including 2 USB 3.0 Type C, 2 USB 3.0 Type A, a DTS Headphone:X® jack, a Microphone input/headphone out combo jack, and a 3-in-1 media card reader. Thermal engineering is a crucial component of this design. Two 120mm fans, an option for liquid cooling, and 32L case volume keep the temperature down while you're in the heat of battle. Crank up the tempo and keep the temperature down. All-around edge vents on the left and right sides are designed to efficiently pull in cool air to help offset heat from the desktop's crucial components. Fine-tune and customize your setup with OMEN Command Center. The included software gives you the boost you need to rank up and deliver serious damage. Amp up your game with an easy-to-use interface for overclocking your processor2 and built in safeguards to help reduce the risk of component damage. DTS Headphone:X® technology comes built-in for a surround sound experience that puts you right in the middle of the action. and show your enemies what it means to be on full alert. Sweep the leaderboards and dominate fast-paced combat with the new lineup of OMEN Displays. Lightning fast refresh rates,7 up to 165Hz, and the latest graphics technology â€“ say no more. When all your components work together just right, your enemies might as well prepare for the worst. With cutting-edge features like 12,000 DPI on the OMEN Mouse, blue mechanical switches on the OMEN Keyboard, and a custom DTS Headphone:X® profile for the OMEN Headset, your opponents won't be able to gain the upper hand. Multi-core is designed to improve performance of certain software products. Not all customers or software applications will necessarily benefit from use of this technology. Performance and clock frequency will vary depending on application workload and your hardware and software configurations. Intelâ€™s numbering is not a measurement of higher performance. Altering clock frequency and/or voltage may: (i) reduce system stability and useful life of the system, processor, and other system components; (ii) cause the processor and other system components to fail; (iii) cause reductions in system performance; (iv) cause additional heat or other damage; and (v) affect system data integrity. HP and Intel have not tested, and does not warrant, the operation of the processor beyond its specifications. HP and Intel have not tested, and do not warranty, the operation of other system components beyond their industry standard specifications. HP and Intel assume no responsibility that the processor and other system components, including if used with altered clock frequencies and/or voltages, will be fit for any particular purpose. Amount of memory varies by configuration. For hard drives, GB = 1 billion bytes. Actual formatted capacity is less. Up to 35GB of system disk is reserved for system recovery software. Based on HP internal testing using CrystalDiskMark benchmarking software. Performance is sequentially faster (read only) compared to traditional 5,400 rpm HDD. All performance specifications represent the typical specifications provided by HP's component manufacturers; actual performance may vary either higher or lower. FreeSync is an AMD technology is enabled on FHD displays and is designed to eliminate stuttering and/or tearing in games and videos by locking a displayâ€™s refresh rate to the frame rate of the graphics card. Monitor, AMD Radeon Graphics and/or AMD A-Series APU compliant with DisplayPort™ Adaptive-Sync required. AMD Catalyst™ 15.2 Beta (or newer) required. Adaptive refresh rates vary by display. NVIDIA, GeForce, Surround, and the NVIDIA logo are trademarks and/or registered trademarks of NVIDIA Corporation in the U.S. and other countries. For DTS patents, see http://patents.dts.com. Manufactured under license from DTS Licensing Limited. DTS, the Symbol, & DTS and the Symbol together are registered trademarks, and HEADPHONE:X and the DTS HEADPHONE:X logo are trademarks of DTS, Inc. ©DTS, Inc.
DisplayPort™ and the DisplayPort™ logo are trademarks owned by theVideo Electronics Standards Association (VESA®) in the United States and other countries. Video Electronics Standards Association (VESA®) in the United States and other countries. Going from average gamer to gaming legend takes power that doesn’t call for reinforcements. The OMEN Desktop is geared with a cutting-edge design, the industry’s latest hardware, and easy upgradability to crush the latest AAA titles, and give you the top-tier performance competition demands. Save $200 off $999+ with code: 200GAMER; Save $300 off $1,499+ with code: 300GAMER; Save $400 off $1,999+ with code: 400GAMER. Coupons not combinable with other offers (except game bundle). Limit 1 PC per coupon per order. Wireless access point and Internet service required. Availability of public wireless access points limited. The specifications for the 802.11ac WLAN are draft specifications and are not final. If the final specifications differ from the draft specifications, it may affect the ability of the PC to communicate with other 802.11ac WLAN devices. For storage drives, GB = 1 billion bytes. Actual formatted capacity is less. Up to 35GB of drive is reserved for system recovery software. Listening to personal stereo equipment at full volume for long periods can damage the user’s hearing. To reduce the risk of hearing damage, lower the volume and amount of time listening at full volume. For DTS patents, see http://patents.dts.com . Manufactured under license from DTS Licensing Limited. DTS, the Symbol, & DTS and the Symbol together are registered trademarks, and HEADPHONE:X and the DTS HEADPHONE:X logo are trademarks of DTS, Inc. © DTS, Inc. All Rights Reserved. Internet access required and not included. Subscription required after expiration. McAfee, LiveSafe and the McAfee logo are trademarks or registered trademarks of McAfee, Inc. in the United States and other countries. 16 For DTS patents, see http://patents.dts.com . Manufactured under license from DTS Licensing Limited. DTS, the Symbol, & DTS and the Symbol together are registered trademarks, and HEADPHONE:X and the DTS HEADPHONE:X logo are trademarks of DTS, Inc. © DTS, Inc. All Rights Reserved. 8 Wireless access point and Internet service required. Availability of public wireless access points limited. The specifications for the 802.11ac WLAN are draft specifications and are not final. If the final specifications differ from the draft specifications, it may affect the ability of the PC to communicate with other 802.11ac WLAN devices. 9 Bluetooth® is a trademark owned by its proprietor and used by HP Inc. under license. Get Fortnite bundle (2000 V-Bucks, outfit, glider, pickaxe, back bling) when you purchase eligible HP PCs with GeForce® GTX 1070 Ti, 1070, 1060, 1050Ti, or 1050 graphics. Redemption instruction will be sent out by email within 30 days after purchase. If you’re serious about gaming, you need a machine that can handle the heat and also provide the cutting-edge processor, memory, graphics options, and storage you need. 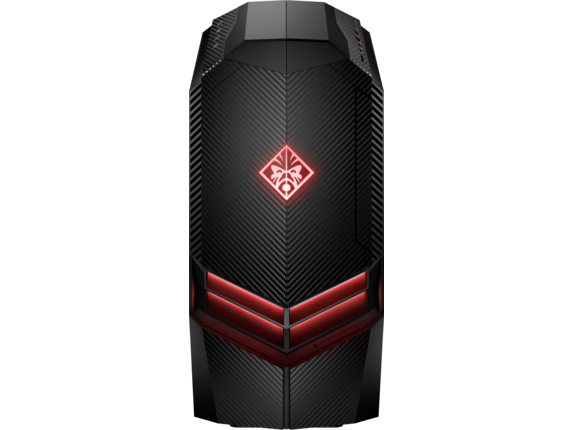 With the OMEN gaming desktop from HP, you can become unstoppable and customize your arsenal, all without breaking the bank. Whether you’re competing professionally or you’re a weekend warrior, OMEN is the gaming PC to take you to another level. What makes the OMEN desktop such a fire machine? Let’s count the ways: the latest 8th-generation Intel® Core™ processors (up to 4.6 GHz i7), up to 32GB DDR4 memory, and state-of-the-art NVIDIA® GeForce® GTX GPUs. And with hard drive options that run up to 2TB, you’ll never run out of space for the newest games and any DLC and mods they may have. 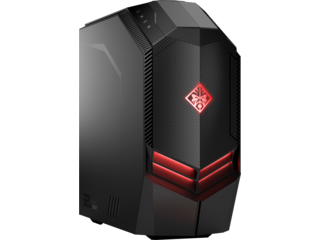 Whatever your gaming needs, there’s an OMEN gaming desktop to satisfy them. Also, while you may not have paid much attention to headphone jacks in the past, that’s about to change when you hear the difference of the DTS Headphone:X® jack. You’ll hear every movement in lush three-dimensional surround sound, perfect for when your opponent is creeping around the corner or when you just want to be immersed in your favorite gaming soundtrack. 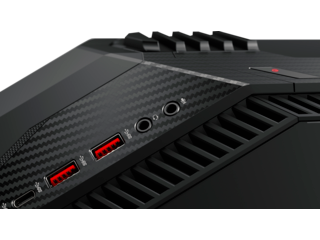 Gaming machines are all about customization, and with the OMEN desktop, you get a solid HP foundation boasting plenty of room for making your custom gaming desktop. 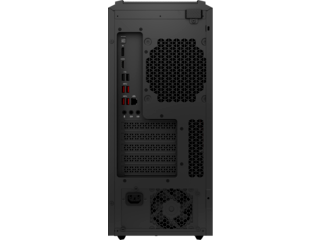 It’ll easily fit many of your expansions and peripherals with up to four 3.5” internal bays accessible via a tool-less door, 2 PCIe x 16 and 2 M.2 expansion slots, and up to four USB ports (2.0, 3.0 or 3.0 type-C available). What’s more, with select OMEN desktop models, you’ll get a processor unlocked for overclocking. And you can do this easily with the OMEN Command Center, a straightforward software interface made for overclocking, along with our built-in safeguards to help reduce the risk of component damage. Your opponents won’t know what hit them. Also, thanks to an integrated handle for easy transportation, all this power is surprisingly mobile, too. If you’re a gamer, then you may already know that all the power in the world can’t save you from an overheating machine. With the OMEN, however, you get customizability with HP’s quality features for keeping everything nice and cool. Its all-around edge vents, two 120mm fans, and optional liquid cooling make sure you’ll never be caught melting when the action heats up. With a sleek machine design, ample customizability, and the latest and greatest components, the OMEN desktop is your new gaming powerhouse. Get ready for peak performance on the latest AAA titles from a desktop built to kill. Learn How to Play Roblox on Your PC with this handy guide.